It was an eventful week in Division II/USAG action, with Lindenwood pulling away from the pack with yet another 195+ mark. West Chester also had a great week, with a season high in the team total as well as on two events; Southern Connecticut set another program record and Seattle Pacific scored its fourth straight 192+. Division leaders Lindenwood and Texas Woman’s will face off at the MIC championship Friday evening; expect a close and contentious battle there. Southern Connecticut is hosting the DII ECAC championship this year, and though rankings might lead you to believe Bridgeport will run away with the title, don’t be fooled that it will be easy—West Chester outscored Bridgeport this weekend. Seattle Pacific will travel to Air Force for MPSFs and attempt to avenge its narrow loss to the Falcons this weekend. Division III took a week off in preparation for NCGA championships, with the exception of Centenary College, which isn’t an NCGA member. The Ladies took advantage of their bonus week to score a solid 190.000. If you missed Division III this week, don’t worry; nationals begin at 5 p.m. ET Friday! 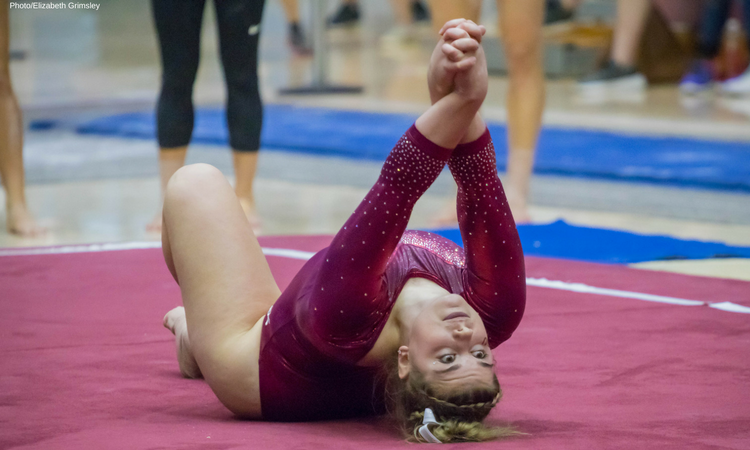 Texas Woman’s didn’t have its best day on “Senior Sunday” versus Oklahoma, including an atypically difficult floor rotation; the Pioneers totaled just a 47.575 on the event, over a point below their RQS. 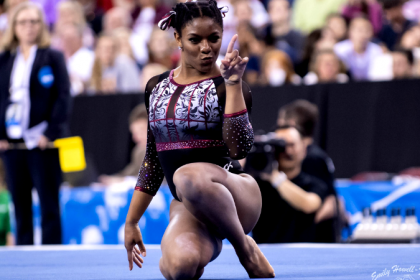 However, there were bright spots, as Schyler Jones set a career high of 39.400 in the all around on her senior day. Fellow senior Mallory Moredock also shined, scoring 9.825+ on all three of her events. The Pioneers’ senior class is their greatest weapon, and they’ll hope to take full advantage of this cohort in their last collegiate postseason. Lindenwood finished second at the State of Missouri meet on Friday, scoring 195+ for the fourth straight meet—a program record. It’s also only the Lions’ third 195+ in a regular season road meet; all three of these results took place within the last month. Courtney Mitchell led the team with two scores of 9.825, and Andy Alexander and Kierstin Sokolowski both contributed three 9.700+ scores to the effort. 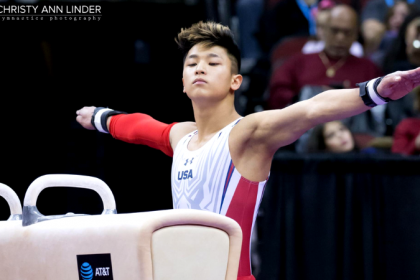 Lindenwood is looking like an increasingly secure favorite for the USAG national title but will have an opportunity to test itself against rival Texas Woman’s at a home conference championship next week. West Chester set season highs on beam, floor and in the team total. SCSU set program records on beam and in the team total. 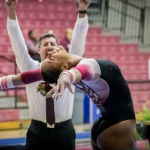 West Chester recorded a season high on senior night to move into qualifying position for USAG nationals. The Golden Rams’ final score was nine tenths higher than their previous high, and they set season highs on beam and floor. They also swept the event titles, with Jessica Meakim, Myranda Marshall and Meghan Chan collecting individual honors. Southern Connecticut set a program record in the team total, led by Alexandra Avendano, who lead the team on vault and floor. Freshman Keara Loughlin set the pace on beam, recording a career high with a 9.775. The Owls have a great chance for one last great total in their record-breaking season as they host the ECAC Division II Conference Championship next Saturday. Bridgeport set a season high 49.125 on beam.